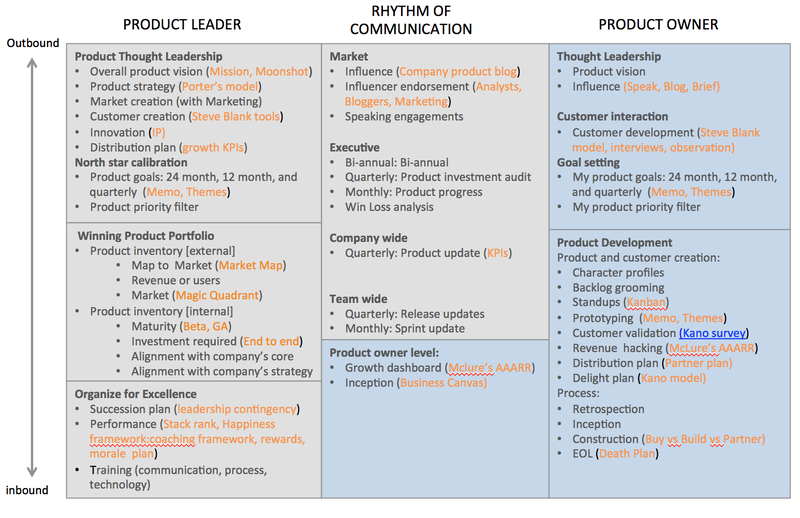 How is a product leader different from a product owner? This question has come up often in my mentoring sessions and here is an attempt at capturing best practices and product leader responsibilities recommendations. Product owner is now a well understood role in technology industry. Product leader on the other hand is not very well understood. I liked a recent tweet that said a product owner is the janitor as well as CEO of his product. Product leader is a seasoned product owner who has graduated to manage a few product owners. In a startup, a product owner and product leader are one and the same. A start-up or a single product person company has a daunting task for that person. The visual below illustrates key responsibilities of the two roles. It also suggests tool/s that can be used for each. This is in no way a comprehensive or a prescriptive list. It is a recommendation based on various industry leading best practices and sources. I’d love to hear back from other product people. A company that has growing number of products has two alternatives (1) the founder continues to be their product leader with our without a team of product owners or (2) a product leader is appointed to manage the overall product portfolio. Product leader and product owner are essentially the same type of people – they are product people. Both create products that users love. Even though both have same product DNA they operate at different levels of execution. Product portfolio management, analogous to securities portfolio management, is a key difference, and involves a well thought strategy for the constituents of your portfolio (stocks, bonds, options etc.) – which ones to invest in and which ones to divest in, and why. The other responsibilities are common to any other leader however with a strong product flavor: product thought leadership , organizational excellence, and high impact communication. Overall product vision: a unified vision for all products. Tools: vision statement (derived from company’s vision statement) and moonshot approach. Competitive strategy: Market fit, partnership, and threat mitigation. Tool: Porter’s Strategy. Customer creation: Customer validation. Tool: Steve Blank customer creation. Growth plan: Overall KPIs and distribution plan. Tools: partnership plan, Mclure’s KPIs. Product priority filter: filter applicable across products. Product goals: 24 month, 12 month, and quarterly. Tools: memo, themes. Map to Market. Tool: Market Map. Revenue or users and growth history and projections. Investment required: end-to-end cost including dev, qa, deployment, marketing. Porter’s Five forces is an elemental business strategy tool often overused across the globe. Another framework introduced in the 2nd chapter of his Iconic book, Competitive Strategy, is SoSA or Source of Strategic Advantage framework. This powerful and less frequently used framework blends SWOT with intrinsic company values to determine what is the real source of its competitive edge. This source is tied to company’s DNA and it is critical to determine this source of competitive edge and align the entire organization towards one of the three directions – Cost Leadership, Product/Service Differentiation or Niche Leadership. Also, continually evaluate that alignment for every investment and decision made thereafter. SoSA framework urges you to think about two internal factors and two external factors that define a company’s competitive psyche. Internal factors are company’s intrinsic strengths and its core values that it’s employees and founders subscribe to (e.g. open source, data driven ). External factors are opportunities in the market and environmental implications (e.g. policies, govt, regulations, privacy implications). It must be one and only one of the above. Picking two can be disastrous. Interestingly enough most upcoming enterprises try to be more than one. Critics of this framework say hybrid strategies do succeed citing Amazon’s example. In reality, successful hybrid strategies start with spin-ins trying out a new concept that might not be aligned with your most relevant direction. Hybrid strategies might work after you have succeeded and proven a business aligned to on of the above three directions. Customer Development framework and searching for your early customers. Of the above the last two really determine who the ‘earlyvangelists’ are since they feel the pain points the most and are proactive enough to take steps to alleviate the pain. An alternative and a far more meaningful approach to measure a nation’s wealth is described in the July Economist article Real Wealth of Nations . Perhaps, lessons from this can be applied to private and public companies. Not just assets and revenue but also intangibles: creativity, culture, and education. Creativity to conjure blue oceans. Culture to have a nurturing environment. Education to drive research, standards and openness. I am a big fan of schumpeter’s column in the Economist. If all schumpeter’s articles were bundled into a book it would certainly make a very useful navigational guide to the business badlands like terrain. The write-up on leadership and power (Sep 2010) and what it takes to climb up the corporate ladder is particularly well written. It confirms the vox populi – lack of correlation between ability and power. However, the fact that power leads to better health, more friends, and a healthier heart doesn’t really resonate with what we have witnessed in the lost decade. None of the above attributes can be ascribed to the profligate leaders of the disgraced corporations – BP, Lehman, Enron. A critical attribute of a successful leader that Schumpeter might have missed out is the effective articulation of a compelling vision and ensuring that this vision trickles down and continously energises all employees. The August edition of the Economist raises a very relevant question (﻿http://www.economist.com/node/16843627?story_id=16843627) : whether the sun is finally setting on the public company (vs the private company)? I started thinking about Skype’s recent announcement of going public and whether that is a good or a a bad move. Although, the offering is not significant, going public would force Skype to react to impatient investors and erratic street expectations. Skype’s core competency has been cutting edge technology innovation and exploring unprecedented business model that pioneered the destructive creation of domestic telecom industry. Would Skype continue to innovate when suddenly its goal will be more aligned towards the Street’s quarterly expectations? In skype’s case the problem is further exacerbated by Ebay’s 3 years long failed adoption of Skype that had slowed the rate of innovation. Now is the time for it to start exploring the next round of creative solutions with wireless technology and wireless carriers and for that it needs to be free of the Street’s shackles. Why aren’t my Latin American Mutual Funds doing as well? This is quite interesting since, typically, lower population and homogeneous demography are considered key ingredients for success. South American countries qualify in both those areas yet this region gets dinged due to lower productivity growth. Although Chile and Brazil might be a little ahead of others we have to wait for quite some time before the benefits of education and infrastructure start impacting productivity positively. 3 Gs of negotiation is part of groundwork that must be carefully done before the first negotiation meeting. Give: Information that will/may be offered to the other party (ies) at the appropriate time. Keep in mind Give and Get go hand-in-hand. Get : Information that needs to be obtained from the other party (ies) or from other sources. This can be driven by understanding self-interest of the parties involved. Guard : Information that must be kept confidential or that will only be given under limited circumstances. This is perhaps most important and can be used when exploring BATNA (Best Alternative to No Agreement). In light of the ongoing economic meltdown in Greece, the Economist has an interesting article that quantifies debt sustainability of countries. It uses the simple reasoning that if interest rate paid on debt is more than the economy’s growth rate (represented by GDP) – the country might be in trouble. Why state sponsored entrepreneurship worked in Israel?